Fauvism got both its start and its name at a 1905 exhibition held at the Paris Salon d'Automne where it was heralded as a new style under the unofficial leader of the group, Henri Matisse who was to become the most enduring Fauvist. The works of Fauvist artists, marked by audacious transpositions, forceful brushstrokes and the emotional use of color was inspired by Impressionism and the works of Vincent Van Gogh and Paul Signac. 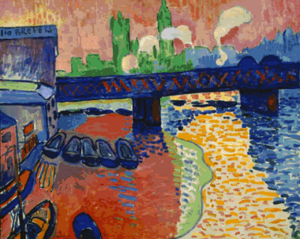 Fauvism was the first of the major avant-garde movements in European twentieth-century art. They sought to break with traditional representations in art. Rather than merely challenging the viewer, however, their vigorous vision included discordant color groupings and bold shapes that were meant to please and instill a sense of well being. Although the group was short-lived, Fauvists were among the first of twentieth-century artists to be inspired by non-Western art such as Japanese prints, Near Eastern textiles, pottery and paintings. Maurice de Vlaminck, considered one of the boldest of the Fauvists, was quoted as saying, that Fauvism was not an invention, an attitude, but a manner of being, of acting, of thinking, of breathing. After their first exhibition in 1905, the art critic, Louis Vauxcelles coined the term the Fauves (French for "wild beasts")—an initially pejorative term—for the loose assemblage of artists gathered under the leadership of Henri Matisse. Although the group did not strictly adhere to a set of principles, they came together through friendship and a shared philosophical view of their art. Both Matisse and Andre Derain had studied under Gustave Moreau, who was a professor at the École des Beaux-Arts in Paris, and a Symbolist painter. He pushed his students to think outside the lines of a formal aesthetic and to follow their own vision. Fauvism was our ordeal by fire...Those were the years of photography. This may have influenced us, and played a part in our reaction against anything resembling a snapshot of life...Colors became charges of dynamite. They were expected to discharge light....with our flat tones we even preserved a concern for mass, giving for example to a spot of sand a heaviness it did not possess, so as to bring out the fluidity of the water, the lightness of the sky...The great merit of this method was to free the picture from all imitative and conventional contact. Fauvism is characterized by a violence of colors often applied unmixed from commercially produced tubes of paint and applied in broad flat areas. The Fauves favored the juxtaposition of complementary hues such as rose with pale green (see The Beach at Sainte-Adresse, Raoul Dufy 1906). Also in favor were jewel-like and opulent colors such as turquoise, mauve, and heavy blue. In the Matisse painting Open Window, Collioure (1905) one sees the Collioure fishing boats with their vermilion masts floating on pink and pale blue water. While some areas followed the natural color of objects, others could be completely artificial, but brilliantly emotive. Matisse's paintings La Danse and Derain's The Two Barges, use powerful blues, oranges, reds and other forceful colors in order to capture the attention of the viewer. It was Matisse's belief that light could not be reproduced in painting but must be represented by color (see Red Room (Harmony in Red). The Fauvists were notably festive and incorporated brightly striped flags, sailboats, and beach scenes. They were attracted to bold patterns and intense colors such as those found typically on a boardwalk by the seashore (see The Beach at Trouville Albert Marquet 1906). Holidays were a favorite theme of twentieth-century artists and the Fauvists were no exception. Whereas earlier genres of art had portrayed ordinary people in day-to-day activities the Fauvists sought out colorful locales. Fauvism's curved lines and bold colors were inspired by diverse works of art from Duccio Di Buoninsegna to Jean-Auguste Dominique Ingres through the Renaissance period up to Romanticism. The influence of African fetishes, Polynesian wood carvings and sculptures of ancient Central and South America can be seen in Fauvism's unexpected shapes and vibrant colors, as well. Many artists who cannot be strictly categorized as Fauvists went through a Fauvist period—artists such as Picasso's partner in Cubism, Georges Braque, the Dutch painter Kees van Donges, and Albert Marquet. Other disciples of Fauvism include: Charles Camoin, the Belgian painter Henri Evenepoel, French painters Jean Puy, Othon Friesz, and the Swiss painter Alice Bailly. Next to Matisse, Raoul Duffy worked the longest in this genre. Fauvism was a transitional phase for most of the artists, who by 1908, having renewed their interest in Paul Cezanne's vision of order and structure, abandoned Fauvism for Cubism. Matisse alone continued on the course he had pioneered. Like other new forms of avant-garde art at the beginning of the twentieth century, Fauvism was initially reacted to with criticism and alarm. However, as the first in a series of new art movements Fauvism was to have an tremendous effect on the rise of Expressionism, Orphism and the development of Abstract art. Andre Derain believed that color should be used to create the expressive and emotional content of a picture. His art, along with other Fauvists, foreshadowed later works devoted solely to the interaction of color and form like those produced by color field painter, Mark Rothko. Enigmatic art dealer and patron Ambroise Vollard encouraged Fauvist protoges like Maurice de Vlaminck and Georges Rouault to branch out into other media including ceramics, prints, sculpture and even furniture. Modern day French painter Emile Bellet has said that he bases his techniques on the work of the Fauvist artists. ↑ John Rewald, The John Hay Whitney Collection, National Gallery of Art, Washington. ↑ Jane Turner, (ed. ), The Dictionary of Art (Oxford University Press, 1996, ISBN 0-19-517068-7). ↑ Richard G. Tansey and Fred S. Kleiner, Gardner's Art Through the Ages (Harcourt Brace, 1996). ↑ Richard G. Tansey, and Fred S. Kleiner, Gardner's Art Through the Ages (Harcourt Brace, 1996). ↑ Rebecca A. Rabinow (ed. ), Cezanne to Picasso, Ambroise Vollard, Patron of the Avant-Garde (Yale University Press, 2006). Gerdts, William H. 1997. The Color of Modernism: The American Fauves. April 29th to July 26th, 1997. New York, NY: Hollis Taggart Galleries. Whitfield, Sarah. 1991. Fauvism. World of art series. London: Thames and Hudson. This page was last modified on 26 March 2017, at 23:42.